This is the Radish Spirit from Spirited Away. I based the color on the image below, but it doesn't really match the color of the Japanese daikon radish, which is closer to yellow. 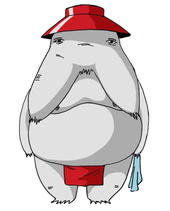 Spirited Away takes place at a spa for spirits and I assume the Radish Spirit is meant to be wearing a g-string-like cover up for the time not spent soaking in hot water. The image shows a little flap to cover up whatever genital organs vegetable spirit entities may possess in the front, but I wasn't sure about the back. I gave him the modesty flap in the back because he didn't really have a waist and I didn't think the strap around the back side looked like it would hold. This image shows the real color of the daikon radish.